From figure 1.0's tabulated data, we can deduce a few key assumptions regarding China's air quality in China. - The top 10 listed cities’ average annual PM 2.5 air pollution concentration are nearly three times the Chinese standards for PM 2.5. Overall, northern China is much more polluted than southern China, with Hebei being the most polluted province. 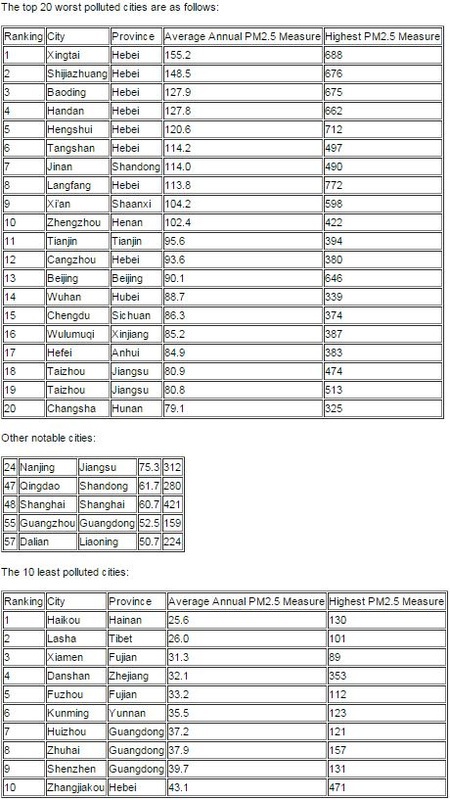 -All of the top 13 most polluted cities were north of the Huai River. Seven of its cities (Xingtai, Shijiazhuang, Baoding, Handan, Hengshui, Tangshan, Langfang) measured over 3 times the Chinese standard for PM2.5. Xingtai and Shijiazhuang’s average annual PM 2.5 air pollution concentration are over 4 times the national standard. All six of the worst polluted cities are situated in Hebei. Xingtai, located in southern Hebei, leads the list of worst polluted cities with an average of 155.2 micrograms per cubic meter. All 74 cities listed in the report failed to meet the World Health Organization’s recommendations for particulate matter of 2.5 micrometers or less (PM2.5). -In 2012, the Chinese Ministry of Environmental Protection established an annual standard of 35 micrograms per cubic meter for PM2.5. The WHO(World Health Organisation) recommends a maximum of 10 micrograms per cubic meter, and the U.S. Environmental Protection Agency standard is 12. By any measure, China’s air is excessively polluted. -Only five met the Chinese government’s less stringent standards for PM2.5 levels. Each of Guangdong’s cities ranked among the 20 least polluted cities, and six of the nine average less than 50 micrograms per cubic meter. Both of Fuzhou’s cities, Fujian and Xiamen, met China’s standards, averaging 33.2 and 31.3 respectively. Finally, Haikou, on the paradise island of Hainan, south of Guangdong, was the least polluted of all, averaging 25.6 micrograms per cubic meter.